The further along your child gets in the Modern Curriculum Press (MCP) Spelling Workout homeschool program, the more confident he or she will be in his or her Spelling abilities. This curriculum for homeschooling spans from Grade 1 to Grade 8, helping your child become a skilled speller. In Grade 5, you will find the materials you need to craft more advanced lessons that simultaneously solidify foundational concepts and progress your child's understanding of written English. MCP Spelling Workout: Grade 5 was designed to be a step-by-step process that's easy to implement into the whole of your child's homeschool program. The material is incredibly flexible, allowing you to spring ahead or revisit topics when necessary. Because the curriculum in MCP Spelling Workout: Grade 5 is so dynamic, crafting lesson plans should be both a joy and a cinch. Additionally, the program will provide your child with an engaging Spelling journey. He or she will get to read cross-curricular stories, complete riddles and puzzles, and write fun passages. All of these activities are designed to improve your child's Spelling abilities while enjoying his or her academic progression through MCP Spelling Workout. You can further enhance your child's understanding of the English language structure by pairing MCP Spelling Workout with the corresponding MCP Plaid Phonics program. MCP Plaid Phonics can work in conjunction with the Spelling program to give your child a multidimensional look at the subject. Of course, MCP Spelling Workout: Grade 5 is a complete curriculum all on its own. The program comes with numerous components that make your job as a homeschool parent easier. For more information on the specific materials included in MCP Spelling Workout: Grade 5, visit the Features and Benefits page. 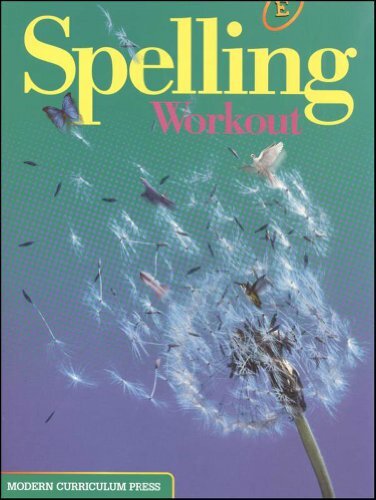 With Spelling Workout, every child can become a successful speller in no time. This high-interest program offers an easy-to-implement step-by-step approach to spelling success. Spelling Workout has all the components you need to go from simple sound-letter relationships to more complex spelling patterns. Your child will learn spelling skills based on phonics through unique, cross-curricular reading passages, practice, and high-interest writing activities. Packed with flexible lessons, motivating activities, including fun riddles and puzzles, this dynamic program promotes spelling success! You can use Spelling Workout together with MCP "Plaid" Phonics to provide your child with a complete phonics and spelling curriculum.